Tajimaya is a famous restaurant from Osaka well known for serving dried aged beef. Finally it opened a branch in tokyo at the Toranomon Hills some time ago. The queue to get into the restaurant has been amazingly long when it first opened and there was a 2 week waiting list to get in to the restaurant the first couple of months after it opened. The picture above shows the restaurant sign from the outside. 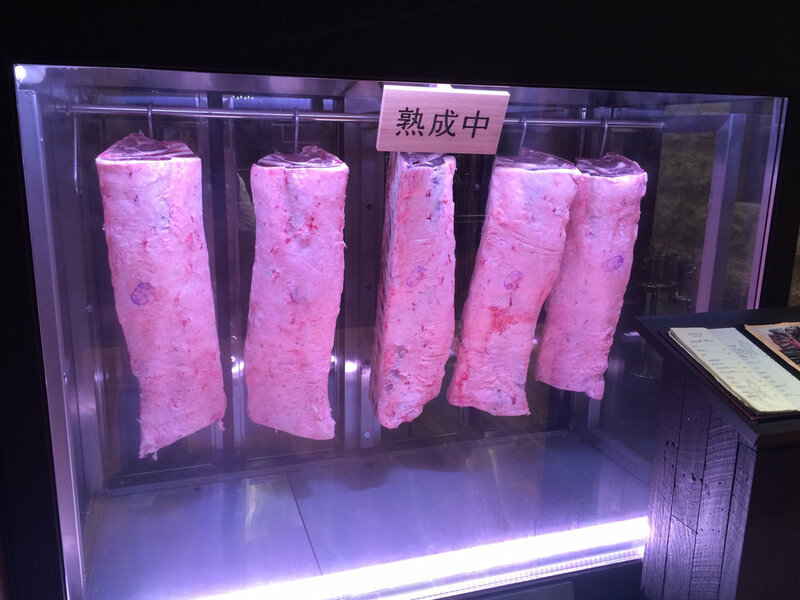 Upon entering, you will be greeted by a mouth watering display of marbled beef guaranteed to spice up your appetite. Below, a picture of the perfect marbled beef dry aged beef on display. I found the dark stone era concept of the plates and cutleries very unique. On the plates, two Chinese characters are written,「牛」that means Bovine and 「心」that means Heart. Now lets start with the meal. For my appetizer I had a very green salad. There was no other color on my plate and it was a fresh starter before the heavy meal ahead. The 2nd dish was an irresistible Japanese Beef sushi that we kept on reordering until they had nothing left. It was absolutely delicious. The main course is of course the prime beef. I found the meat to be very juicy and had a very delicate smokey taste to it. For those of you who are on a diet or simply do not enjoy rich, fatty beef, the lean meat is definitely an option. If you find the meat too raw, you have the option of grilling the meat on a hot stone plate. I added butter mixed with sho-yu on top. This is what I did so I could try the meat in rare, medium and well done. they were all good. Breads are not normally served in Japanese grilled beef restaurants but they do serve bread with the main course in Tajiyama. I liked this. It made them different. It may sound crazy, but even after all the delicious dishes above we were still hungry and added a T-bone steak to fill the corners of our tummies. Just take a look at this beauty. I loved the whole Tajiyama experience. The new restaurant in Tokyo is very different from the ones in Osaka where you grill the meat yourself like a normal yakiniku restaurant. Here , the beef is served steak style, the dry aged beef being the prima donna of our dinner journey.Price is 10.000 yen per person.